A few weeks ago, a sale on cherries (and over enthusiasm on my part) left me with a bit of a surplus that needed to be used up. 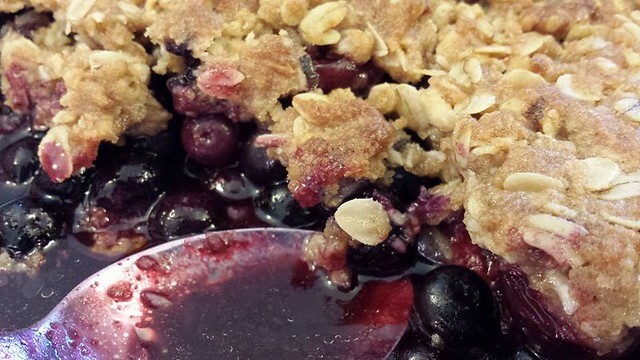 There are so many ways that you can use cherries, but when you combine my laziness with my love of flavour, I don't think you can beat a crumble/crisp. It's rustic and simple, comes together quickly and makes for a really tasty dessert (or breakfast!). I won't try to fool you into thinking this is health food (because it's not), but I like to use whole food/whole grain ingredients as much as I can and I think the whole grains really give a nice hearty balance with the fruit. 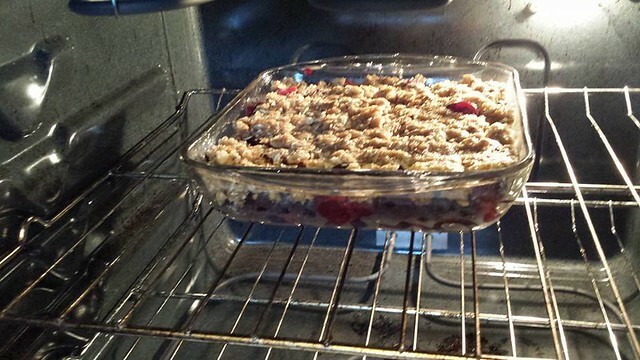 Because this was a recipe I came up with on the fly, I used some frozen fruit, but fresh would likely be better. And the pictures are terrible because I took them on the phone. But whatever...I figured the internet needed to have this dessert recipe. Especially now that cherries are coming into season. 2. Spray/oil/butter a 9x9 baking dish. Put the fruit directly in the dish, then scatter over the 1/3 c brown sugar and cornstarch. 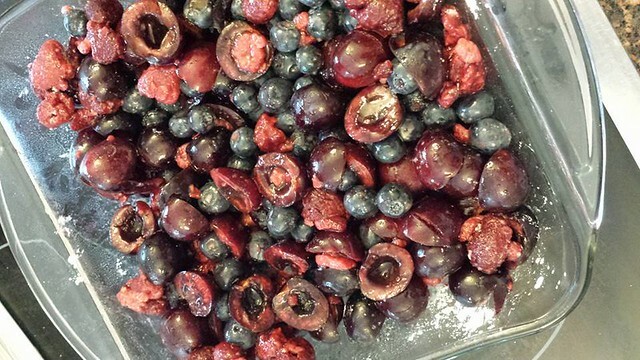 Mix a bit to combine (if your fruit is really ripe, you can maybe skip the sugar, but I liked the level of sweetness this provided). BTW, if you don't have a cherry pitter (which I don't), I find that the easiest way to pit cherries is to squish them a bit with a knife until you feel them give a bit (squish away from yourself so you don't stain your clothes! ), then you can cut around the pit and it will pop out easily. Your kitchen will still look like a murder scene, but it's easier than trying to just dig out the pits. 3. Combine the topping ingredients - I like to use melted butter because I'm lazy and it's easier to mix in. You could take the long way around and cut the butter into the dry ingredients, but I wouldn't bother. ;) Sprinkle/spread the topping over the fruit. It doesn't have to be perfect. Squish it down a bit, but don't fuss too much. 4. Bake for about 30-35 minutes (keep an eye on your topping so it doesn't burn).